Frequently newer members ask about deadheading. Basically the questions are, what is it, why do we do it and how do we do it? We do ourselves a great disservice if, as established growers, we appear divided on the merits of this very basic horticultural procedure. The lack of consensus and understanding among recognised growers is quite surprising. This was revealed in an email group on the net. In Australia, we expect each presently flowering shoot to produce two or more flowering shoots the following year if the plant is in a well-lit position with adequate fertiliser and water, good drainage and deadheaded promptly after flowering. Not only is the flowering for the next year promoted by deadheading, most would agree that the appearance is more aesthetic. This article presents evidence for deadheading. Deadheading is the removal of dead flowers and young seed pods. It is best done immediately after the flowers are past their peak. Methods vary depending on the variety. Taking the truss between the index finger and thumb and bending easily deadheads most elepidotes. If the spike is curved, bend the stalk outwards. Some elepidotes and many lepidotes, including vireyas, will take the top few leaves with it with this method. A stripping and nipping action may be necessary. In Frank Kingdon Ward's Riddle of the Tsangpo Gorges , originally written seventy-five years ago, the following wisdom is offered on page 166. "In nature Rhododendrons rarely flower well for two consecutive years, because a good flowering period, if followed by a heavy seed crop, uses up all the plant's energy; there is none left for building up next year's flower buds. If the plant flowers well this year, but for some reason does not set seed, it may at the same time lay down restingbuds and flower well the following year." This is a biennial bearing pattern when the plants flower well every alternate year. Note, it is the production of seed that is the critical drain on the plant, having a much more profound effect than flowering. What is actually happening in the plant? Plants make their own food from carbon dioxide in the atmosphere and water from the soil using the sun's light energy. The energy of the sun is converted to food energy. One of the first products produced is glucose which is then used either directly for energy, stored as starch, or converted to other substances such as protein and vitamins. One molecule of glucose can only be used for one thing in a plant and there is competition within the plant. It can only go into one of the non-flowering shoots, or a flowering shoot, or a developing seed, or a root etc. When food goes to seeds, they have a very high dry matter content and use up a considerable amount of the plant's available energy. Natural selection is where nature selects the best-adapted plants for the particular environment that they are growing in. Best adapted can mean tallest and fastest growing in a shady site so that the new rhododendron can get plenty of light. It may mean short stumpy growth, ability to withstand freezing, and the capacity to flower and produce seeds quickly with a short growing season in alpine conditions. Good old mother nature helps the young plant in two ways. Firstly, she does not permit flowering for some years. 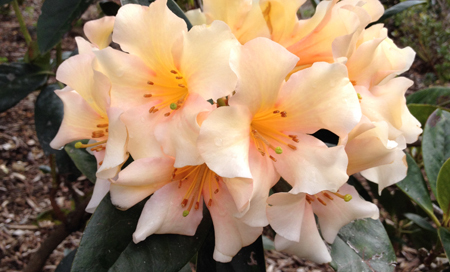 This stops nutrients being wasted when the rhododendron needs all it can get to grow. Also, she disposes of the old through death to make way for the new. Growth energy is not wasted on seeding in the early years. Nature does more than this - she must also preserve the species as well as the individual. The young strong grower must eventually reproduce effectively to pass on its good combination of genes, or they will be lost. We are faced with the question, why does nature permit such wastage on sexual reproduction? There are flowers, nectar and scent to attract pollinators, eggs to be fertilised, pollen to fertilise the eggs and massive wastage of seed. The short answer is of course spread of the species, but there is much more to it than that. The genes in the parent plants are mixed in sexual reproduction when the egg is randomly fertilised by a pollen grain. This gives variation in the offspring and variation is the essential ingredient for natural selection. The majority of the seeds are lost, but those that do survive are the most likely to have the best genetic combinations. Also, desirable gene changes, or mutations, in one plant can get incorporated into the genes of other good plants. The conclusion can only be that the advantages accompanying sexual reproduction outweigh the vast amount of energy that the plant must invest in the process to increase its ability to compete in the continuation of the species. All of this is wonderful, but we gardeners want fine plants with outstanding flowering. Survival of the species is another issue. The flowers that we are after are just the first step in sexual reproduction and a drain on the plant's reserves. If we let the process continue to seeding, then unless we grow all of the seed produced, we are letting the plant waste more energy that could be better used. There can only be one conclusion - deadhead those flowers immediately after each truss has passed its peak and send the nutrition to developing flowers and new growth. There is more to it than this. Kingdon Ward noted biennial bearing. Apple trees will do this and the process of reproduction is very similar to rhododendrons. Orchardists prune and thin their crop to get optimal sized fruit at the expense of more small fruit. They do it for another reason too. Research has shown that seeds release hormones. More small fruits mean more seeds and more hormones. These hormones flow through the tree and inhibit the formation of flower buds, but promote the development of non-flowering shoots. The flowers for next year's crop are produced while this season's fruit is developing. This is the same pattern with rhododendrons. To the best of my knowledge this process has not been demonstrated in rhododendrons, but Frank Kingdon Ward's observations were very astute that it is the seed production that counts rather than just flowering. It would make interesting research, as the process is common in fruiting plants that have been investigated. Some plants flower on the new growth, such as stone fruits and roses. Rose growers know that if they do not remove the developing seed capsules, then flowering will stop. The same process is in operation. There is not only competition for nutrients within the plants, but this season's heavy flowering can reduce the next season's flower initiation if we do not deadhead. The competition within the plant issue gets worse. There is a priority order for nutrition use in a plant. Developing seeds have first call on the nutrients available, followed by other processes. The young seeds not only waste our nutrients that we want channelled into new flower buds, they also get first go at them and our flower bud initiation and young growth must wait in line. Simple observation of seeding shoots through a season will support this. The solution for flowering is to deadhead at the earliest possible convenience. I have heard it said that some dwarf lepidotes, in particular, flower so profusely that it takes too much time to deadhead them. These are of course just the ones that are crying out to be deadheaded and the correct argument is get out there and deadhead them as soon as possible. Many growers have been heard to say that many lepidotes run down with time. Perhaps part of the process is that they run out of energy because they are so generous with their flowers and the subsequent energy loss to seeds? I have experienced 'Kallista' and R. nuttallii dying through over-flowering if they are in too much sun. They will flower profusely and set their seed and have no energy left for any growth. They simply do not come away again. Spare a thought for Seta, which does its best in July and deserves to be deadheaded. Deadheading is a sound horticultural practice that we should all promote. Developing seeds rob our plants of nutrients and reduce growth and flower bud initiation. If you think that plants, which are not deadheaded, are unsightly, then that is only the beginning of it. We can all have regularly flowering plants. Frank Kingdon Ward did more than brave the wilds to find new rhododendrons and bring back seeds; he was an observant and insightful man. Reference: Cox, Kenneth ed., Frank Kingdon Ward's Riddle of the Tsangpo Gorges, Antique Collectors Club, England, 2001 Barry Davidson is a former Secretary and President of the Southern Tasmanian Branch, has served as a National Council member and Editor of The Rhododendron, and as national President of the Society. He grows a huge range of rhododendrons, magnolias, and other ornamental plants at his garden in Claremont, near , Tasmania.